Main objective of this report is to analysis Foreign exchange of Uttara Bank Limited; Malibagh Chowdhurypara Branch. By Foreign Exchange process bank take deposits from customers against interest and lend it to the borrowers against interest for certain period of time. Report also explain how the L/e is opened and how the Export and Import operation is done. Finally draw SWOT analysis and find out some problems related on Foreign Exchange and suggest recommendation. A Bank is a very much indispensable organization in modern economy. It plays a very significant role in the economic development of a country and forms the core of money market in an advanced economy. Globally the banking process and its area of operation are increasing day by day. It is also changing due to technological innovation, deregulation, globalization etc. All these are happening because of its demand. Basically bank take deposits from customers against interest and lend it to the borrowers against interest for certain period of time. My study topic is on Foreign exchange Uttara Bank Limited; A study on Malibagh Chowdhurypara Branch. The main aim of my study is to acquainted knowledge about Foreign exchange Uttara Bank Limited. Bank’s Credit means the credit granted by a banker to his customers. Bank temporarily transfers purchasing power to its borrowers; this provided purchasing power can be termed as loan, credit or advance. It is a lender’s trust in a person’s/ firm’s/ or company’s ability or potential ability and intention to repay. In other words, credit is the ability to command goods or services of another in return for promise to pay such goods or services at some specified time in the future. Bank lends not only its cash, but also its goodwill and belief to customers, such as L/C, traveler’s cheques and traveler’s notes. For a bank, it is the main source of profit and on the other hand, the wrong use of credit would bring disaster not only for the bank but also for the economy as a whole. The objective of the report is to have a real live exposure in the banking Sector. It will help to develop my knowledge in sector. This practical Orientation gives us a change to Co-ordinate of theoretical knowledge with the practical experience. The following are of Objective for this practical orientation in bank. The main objective of the study is to obtain a clear idea and reveal the true picture about the Foreign Exchange Business of UBL. i.e To examine how the L/e is opened and how the Export & Import operation is done. To evaluate the performance of the Uttara Bank Limited (Malibagh Chowdhury Para Branch) Export and Import Business. There are two main sources of collecting data. To complete this report data has been collected from both primary and secondary sources. The primary data has been gathered by formal discussion with the foreign officials and borrowers. Some secondary data has also been collected to make the report more concrete. These data has been collected from different financial statements & annual report. Printed forms & Documents Supplied by UBL. Collected information is processed by the use of computer system. Detailed analysis, working variables, working definitions and evaluations embodied in this report. Uttara Bank Ltd. Is one of the front ranking first generation private sector commercial bank in Bangladesh. The bank has been carrying out business through its 211 branches spreading all over the country. The management of the bank consists of a team led by senior bankers with vast experience in national and international markets. The bank made significant progress in all sectors of business in 2012. Uttara Bank’s operation has achieved the confidence of it’s customer with sound fundamentals in respect of deposit accumulation, loans and advances, import and export business, remittance business and profitability. As a result the bank has been able to earn remarkable profit in business. Overall performance of Uttara Bank Ltd. has been improved for maintaining effective and constructive principals of Bangladesh bank. Uttara bank ltd. had been a nationalized bank in the name of Uttara bank under the Bangladesh bank (Nationalization) order 1972, formerly known as the Eastern banking Corporation Limited which was started functioning on and from 28.01.1965. 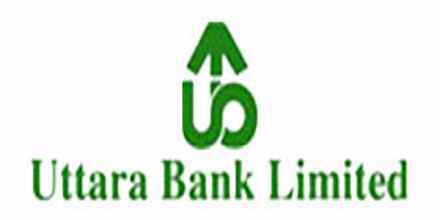 Consequent upon the amendment of Bangladesh Bank (Nationalization) order 1972, the Uttara Bank was converted into Uttara Bank Ltd. as a public Ltd. Company in the year 1983. The Uttara Bank Ltd. was incorporated as a banking company on 29.06.1983 and obtained business commencement certificate on 21.08.1983. The Bank floated its shares in the year 1984. It has 211 branches all over Bangladesh through which it carries out all its banking activities. The Bank is listed in the Dhaka Stock Exchange Ltd.
Uttara Bank financial highlights are growing year to year due to mainly operational efficiency and an increasing customer base. Assets: The increase in asset was mainly driven by significant growth of customer deposits. The growth of deposits was used for funding in foreign excahangeand holding of securities for SLR. As of 31st December 2012 total asset of the Bank stood at TK. 71,946.0 million with an increase of 23.10 percent as against 2011. The increase of asset is determined by investments, loans and advances and money at call and short notice. To be the premier financial institution in the country providing high quality products and services backed by modern technology and a team of highly motivated personnel to deliver excellence in banking. 3 Citi N.A. 4 Prime Bank Ltd.
1 Standard Bank Limited 2 Exim Bank Ltd.
17 Uttara Bank 18 Islami Bank Bangladesh Ltd.
7 United Commercial Ban 8 Rupali Bank Ltd.
FOREIGN EXCHANGE PRACTICE IN UTTARA BANK LTD.
Foreign trade can be easily defined as a business activity, which transudes national boundaries. These may be between parties or government ones. Trades among nations are a common occurrence and normally benefit both the Exporter and Importer. Foreign trade can usually be justified on the principle of comparative advantage. According to this economic principle it is economical profitable for a country to specialize in the production of that commodity in which the producer country has the greater comparative advantage ant to allow the other country to produce that commodity in which it has the lesser comparative advantage. It includes the spectrum of goods, services, investment, technology transfer etc. As more than me currency is involved in foreign trade it gives rise to exchange of currencies which is known as foreign exchange. The term: Foreign Exchange” has three principal meanings. Firstly, it is a term used referring to the currencies of the other countries in terms of any single currency. To a Bangladeshi, Dollar, Pound Sterling etc, are foreign exchange. Secondly, the term also commonly refer to some interments used in international trade Such as bill of exchange, Drafts, Travel Cheque and other means of international remittance. Thirdly, the terms foreign exchange is also quite often referred to the balance in foreign currencies held by a country. In exercise of the power conferred by section 3rd of the foreign exchange regulation, 1947. Bangladesh Bank issues license to schedule bank to deal with exchange. These banks are known as Authorized Dealers. Licenses are also issued by Bangladesh Bank to person or firms to exchange foreign currency instruments such as TC currency notes and coins. They are known as Authorized money changers. Advance for deferred payments exports. Advance Against bills for collection. Opening of letter of credit (L/C). Issue of Demand Draft (DD), TT etc. Payment of DD, Telegraphic Transfer (TT). Issue and enhancement of traveler’s cheque. Sale and enhancement of foreign currency notes. Certificate of Origin of Goods Inspection Certificate. A clause authorizing the beneficiary to draw bills of exchange up to certain on the opener. List of shipping documents, which are to accompany the bills. Description of the goods to be shipped. An undertaking by the opening bank that bills drawn in accordance with the conditions will be dully honored. Instructs to the negotiating banks for obtaining reimbursement of payments under the credit. Parties to a Letter of Credit (L/C). Opening/Issuing Bank: It is the bank which opens/issues a L/C on behalf of the importer. It is also called Importers/buyers bank. Exporter/Seller/Beneficiary is the party in whose favor the L/C is established. Confirming Bank: It is the bank which adds its confirming to the credit and it is done at request of issuing bank Confirming bank may or may not be the advising bank. Advising/Notifying Bank: It is the bank through which the L/C is advised to the exporters. This bank is actually situated in exporters country. It may also assume the role of confirming and or negotiating bank depending upon the condition of the credit. Negotiating Bank: It is the bank that negotiates the bills and pays the amount of the beneficiary. It has to carefully scrutinize the documentary credit before negotiation in order to see whether the documents apparently are in order or not. The advising bank and the negotiating bank may or may not be the same. Sometimes it can also be confirming bank. Paying/Accepting Bank: It is the bank on which the bill will be drawn (as per condition of the credit). It is nominated in the credit to make payments against stipulated documents complying with the terms of the credit. If may or may not be the issuing bank. A bill of leading is a document that is usually stipulated in a credit when the goods are dispatched by sea. It is evidence of a contract of carriage is a receipt for the goods and is a document of title to the goods. It also constituted a document that is, or may be needed to support an insurance claim. Identify marks and numbers if any. The name of the carrying vessel. Evidence that the goods have been loaded on board. The parts of Shipment and discharge. The names of shipper consignee and name and address of the notifying party. Whether fright has been paid or is payable at destination. The number of original bills of leading issued . A bilk of leading specifically status that goods are loaded for ultimate destination specifically mentioned in the credit. Name and address of the buyer and seller. Weight of the goods, number of the package, shipping marks and numbers. Complete reference of the letter of credit number, the relevant import license number. Country. It is issued by chamber of commerce. Trade Associations or any other authority authorized by the government to issue the certificate. This is a certificate declaring that the goods have been examined and found to be in accordance with the contract of sale. This is signed by the manufacturer or supplier, but the contract of sale may require it is to be issued by a recognized independent inspection body. It is also called survey report. The Exporter must prepare a packing list showing, item by item, the contains of them containers or cases to enable the importer of the goods check the shipment, If should give description of the goods, net weight and grows weight, specific packages and thus may facilitate assessment by the customs. Cover the risks specified in the credit. Be consistent with the other documents in its identification of the voyage and description of the goods. Unless otherwise specified in the credit. Be a document issued and/or signed by an insurance company or its agent, or by underwriters. Be dated on or before the date of the date shipment as evidenced by the shipping documents. Be for an amount at least equal to the CIF value of the goods and in the currency of credit. Pro-Forma Invoice is a memorandum of the term of contract of sale wherein the seller gives the quotation to a potential buyer. If the buyer approves its terms he sends definite order for supply. Practically by the term Export we mean out carrying of anything from one country to another. As banker we define export as sending of visible things outside the country for sale. Export trade plays a vital role in the development process of an economy with the caring we meet out import bills. Although export trades is always encouraged, any body cannot export anything to any place. Line importer the exporters are also required to get them registered before entering into export trade Export Registration certificate (ERC) given by ECI & E is required for this purpose. The required documents to obtain ERC are also same as Import Registration Certificate (IRC). When a bank (authorized dealer) receives a L/C (Cable or original) it ascertains the correctness of the lest number and the authorized signature. Then the bank sends the original copy of the L/C to the beneficiary. The export presents the relative documents to the negotiating bank after the shipment of the goods. The L/C issuing bank undertakes to honor is obligation only if the beneficiary fulfills the conditions stipulated time. Even a slide deviation of the documents from these specified in the L/C may give an excuse to the negotiating bank. So the negotiating bank must be careful, promote, systematic and bias-free while scrutinizing the tender document after careful and thorough examination of the document, the banker has to list out the discrepancies. The export and import trade in our country are regulated by imports and exports (control) Act 1950, Under the export policy of Bangladesh the exporter has to get the valid export Registration certificate (ERC) from Cheif controller of Import & Export (CCI&E). The ERC of required to renew every year. The ERC number is to be incorporated on EXP Forms and other papers connected with exports. Memorandum and articles of Association and certificate of Incorporation in care of limited Company. Chamber of Commerce (local & Foreign). After communicating with the buyer exporter has to get contracted (writing or oral) for exporting exportable items from Bangladesh detailing insurance and marks, inspection, arbitration etc. The terms of the L/C are in conformity with those of the contract. The L/C is an irrevocable one preferable by the advising bank. Collection basis (documentary/etc) in URC-525. ICC publication. After making the deal and on the L/C opened in his favor, the next step for the exporter is to set about the task of procuring or manufacturing the contracted materials/merchandise. Bill of Exchange (if required). After those, exporter submits all these documents along with a letter of Indemnity to Uttara Bank Limited (Malibagh Chowdhury Para Branch) for negotiation. An officer scrutinizes all the documents. If the documents are clean, Uttara Bank Limited (Malibagh Chowdhury Para Branch) purchased the documents on the banker-customer relationship. This is known as Foreign Documentary Bill purchases (FDBP). The negotiating bank much be careful promote and bias free will scrutinizing the lender documents. After careful and thorough examination of the documents the banker has to list out the discrepancies. Amount drawn in excess of the L/C. Bill of exchange not properly drawn. Bill of lading or Airway Bill state. Insurance cover note as per terms L/C. Insurance Cover obtained after the Bill of lading or Airway Bill date. Packing list and certificate of analysis not as per the L/C. Document not properly endorsed in favor the Bank. Full shipment not effective and part shipment prohibited. Gross weigh and net weight shown in different documents differ. Same of the documents required by L/C not submitted and. Documents with major discrepancies, which could not be negotiated, should be sent on collection basis with the permission of the exporter. A FDBP Registered is maintained for recording all the particulars. If the exporter is new client. It the bankers is in doubt. Not drawn on L/C issuing bank. Tenor or B/E not identical with L/C. Not issued by the beneficiary. Not made out 1 name of the applicant. Description, price, quantity sales terms of the goods not correspond to the credit. Shipping marks different will B/A & Packing list. Gross weight, net weight & measurement number of cartoons/packages differ with bill of lading (B/L). Not marked me fold as original. Shipping marks differs with B/L . Bill of lading is not drawn or endorsed. “Bill of lading (B/L) Shipping on Board”, “Freight Prepaid” or “Freight collect” etc. notations are not marks on the B/L. B/L not indicate the name and capacity of the party i,e, carrier or master on whose behalf the agent is signing the B/L. Shipped on board notation not showing name of pre-carriage. vessel/intended vessel. Shipped on Board nation not showing part of loading and vessel name (Incase B/L indicates a place of receipt or taking in charge different from the port of loading). Inadequate number of Invoice, Packing List & others submitted. The customer submits the L/C to Uttara Bank Limited (Malibagh Chowdhury Para Branch) along with the documents to negotiate. Uttara Bank Limited (Malibagh Chowdhury Para Branch) official scrutinize the documents to ensure the conformity with the terms and conditions. The documents are then forwarded. The L/C issuing bank gives the acceptance and forwards on acceptance letter. Payment is given the customers on either by collection basis or by purchasing the documents. A LBPD (Local Bill Purchase Documentary) register is maintained to record the acceptance of the issuing Bank until the acceptance is obtained; the record is kept in collection register. Sight Payment Credit: In at sight Payment credits the bank pays the stipulated sum immediately against the exporter’s presentation of the documents. Negotiation credit In negotiation credit, the exporter has to present a bill of exchange payable to his in addition to other documents that he bank negotiation. In deferred pay payment, the bank agrees to pay on a specified future date or went after presentation of the export document. In UBL, payment is given to the party at the rate of A.A 60-90-120-180 as the case may be. In acceptance credit, the exporter presents a bill of exchange payable to himself and drawn at the agreed tenor (that is, on a specified future date event) on the bank that is to accept it. When exporter L/C is transmitted to the bank for advising the bank sends an advising letter to the beneficiary depicting that L/C has been issued. Valued Export Customer of UBL (Malibagh Chowdhury Para Branch). Atlantis Garments and Buying Ltd. Import is the flow of goods and services purchased by economic agents located in one country from economic agents located in another country. Imports in the private sector under united foreign aid must be made on most competitive basis by procuring at least three quotations from two eligible countries. This restriction does not, however apply to import of goods worth up to Taka one lack. Under the Imports and Exports (control) Act, 1950 the Government of Bangladesh formulates the Import Policy through Ministry of Commerce. The existing Import Policy (1997-2002) has come into effect from June 14, 1998 to June 30, 2002. Main Features of Import Policy (1997-2002). Import Facility through import permit and clearance permit. DEPZA, BSC/C and BOI have been treated as patron organization in the case of industrial capital machinery import. Facility of imports for export oriented industries by government, foreign exchange rate. Imports are purchase of foreign goods and services by consumers, firms and government in Bangladesh. In case of a Company, Memorandum & Article of Association and Certificate of Incorporation. Than the importer has to Contact with the seller outside the country to obtain the pro-forma invoice. After the importer accepts the pro-forma invoice, he makes a purchase contract with the exporter detailing the terms and conditions of the import. After making the purchase contract, import procedure differs with different means of payment. In most cases import payment is made by the documentary letter of credit in our country. The other means are cash in advance, open account, nostro and vostro account, loro account and collection methods. It is mentioned in the purchase contract, which payment procedure has to be applied. Importer pays full, partial or progressive payment by a foreign DD, TT. After receiving payment, exporter will send the goods and the transport receipt to the importer. Importer will take delivery from the transport company. Exporter ships the goods and sends transport receipt to the importer. Importer will take delivery and makes payment by foreign DD, TT, at some specified date. Collection methods are either clean collection or documentary collection. Again collection methods may be document against payment or document against acceptance. Another is direct collection in which the exporter obtains his banks pre-numbered direct collection letter. Letter of credit is the well accepted and most commonly used means of payment. It is an undertaking for payment by the issuing bank to the beneficiary upon submission of some stipulated documents and fulfilling the terms and conditions mentioned in the letter of credit. In foreign exchange banking letter of credit (L/C) opening is an important part. L/C opening is a set of procedure which every imported needs to follow to import their product. At first importer need to contact with Exporter and with their mutual understanding exporter prepare pro-forma Invoice and sent it to the importer. After received the pro-forma invoice importer present it to their bank that is known as issuing bank that prepare L/C on behalf of importer. After preparing L/C proposal need to send Head Office of issuing bank for approval. After approval issuing bank open L/C on behalf of Importer, Signed it by proper authority of bank officer, and send it their authorized exporter country bank for authentication. The process is done through SWIFT. The bank that provides authentication then it called advising bank. After given the authentication seal-advising bank send it to the exporter bank as per requirement of invoice. Letter of Credit Authorization (LCA Form). I dent in case of indenture. Credit Report of the Importer. In case of F.O.B/C&F. insurance cover note. In case of quota item, quota allocation paper. Full particulars of Bank account. A credit officer scrutinizes this application and accordingly prepares a proposal and forwards it to the Head Office Credit Committee (HOCC). The committee,if satisfied, sanctions the limit and return back the branch. Thus the importer is entailed for the limit. L/C application properly stamped, signature verified and margin approved and properly retained. Indent/Pro-forma Invoice singed by the Importer and Indenter/Supplier. Ensure that the relevant particulars of L/C application correspond with those stipulated in Indenter y/pro-forma invoice. Validity of LCA entitlement of goods, amount etc, confirms to the L/C application. Charges like commission, Postage, Teller charge, SWIFT charge, if any recovered. Insurance Cover Note-in the name of issuing bank-A/\C importer covering required risks and Voyage role. Incorporation of instruction for Negotiating Bank as per banks existing arrangement. Reimbursement instruction for reimbursing bank. If foreign bank confirmation is required, necessary permission should be obtained and according advising bank is existing arrangement. If add confirmation is required on account of the applicant charge should be recovered from the applicant. In case of askance L/C mention interest rate clearly n the letter of credit. As per Article 9(a) of UCPDC 600, An Irrevocable credit constitutes a definite undertaking of the issuing Bank, provided that the stipulated documents company with the terms and conditions of the credit. Advising means forwarding of a Documentary letter of credit received from the issuing bank to the beneficiary (Exporter). Signature of issuing Bank officials on the L/C verified with the specimen signatures book of the said bank when L/C received. If the exporter L/C is intended to be an operative cable L/C Test code on the L/C invariable be agreed and authenticated by two authorized officers. L/C Scrutinized thoroughly complying with the requisite of concerned UCPDC provisions. The confirmation bank does adding confirmation. Confirmation bank is a bank that adds its confirmation the credit and if is done at the request of the issuing bank. The advising bank usually does not do it if there is not a prior arrangement with the issuing bank. By being involved as a confirming agent the advising bank undertakes to negotiate beneficiary’s bill without recourse to him. Issue L/C and request to add confirmation. Draft to be drawn on L/C opening bank. After issuances and advising of a L/C it may be felt necessary to delete, add or after some of the clauses of the credit. All these modification are communicated to the beneficiary through the some advising bank of the credit. Such modification to a credit are termed as amendment to a letter of credit. UBL transmits the amendment by tested SWIFT to the advising bank. In case of revocable credit it can be amended or cancelled by the issuing bank of any moment & without prior notice to the beneficiary. But in case of irrevocable L/C, it can neither be amended nor cancelled without the agreement of the issuing bank, the advising bank, & the beneficiary. All the amendment forms an integral part of the original credit. If the L/C is amended, service & SWIFT charge is debited from the party account. Increase or decrease value of L/C and increase or decrease of quality of goods. Terms of delivery i.e, FOB, CFR and CIF etc. Name and address of the shipment. Name of the reimbursing bank. Name of the shipping line etc. Settlement means fulfillment of issuing bank in regard to affecting payment subject to satisfying the credit terms. Settlement to may be done under three arrangements as stipulated in the credit. Here the seller presents the documents to the nominated bank and the bank scrutinizes the documents. If satisfied the nominated bank makes payments to the beneficiary. Under this arrangement the seller submits the documents evidencing the shipment to the accepting bank (nominated by the issuing bank for acceptance) accompanied by draft down on the bank at the Specified tenor. After being satisfied with the documents and the draft and at maturity the reimbursement will be obtained in the pre-agreed manner. A Back-to-Back letter of credit is a now credit. It is different from the original credit based on which the Bank undertakes the risk under the back to back credit. In this case, The bank main security is original credit. The original credit (Selling Credit) are separate instrument independent of each other and in no way legally connected though they both from part of the same business operation. The supplier (beneficiary) of the back-to-back credit) ships goods to the importer and presents documents to the bank as is specified in the credit. It is intended the exporter would substitute his our documents for negotiating under the original credit, his liability under the back to back letter of credit would be adjusted out of these proceeds The exporters L/C is market lien and no margin is taken. In UBL (Malibagh Chowdhury Para Branch), Papers/documents required for submission for opening of back to back L/C. Valid Import Registration Certificate (IRC) & Export Registration Certificate (IRC). L/C application & LCA form duty filled in Signed. Issuing Bank is not reputed. Advising Credit by the advising bank without authentication. In case of back –to-back as 60-90-120-180 days of maturity period, deferred payment is made. payment is given after realizing export proceeds from the L/C issuing bank. Under the back to back concept, the seller as beneficiary of the credit, offer it as security to the advising bank fool the issuance of the second credit. As application for this second credit the seller is responsible for reimbursing the bank for payment made under it regardless of whether or not be he is paid under the first credit. There is, however no. compulsion for the bank to issue the second credit, and in fact many banks will not do so. Foreign Remittance means sending of fund. The word Remittance we understand sending or transferring of fund through bank from one place to another place, which may be within the country or between tow countries, one in aborted is called foreign Remittance. The remittances that are received from abroad are called inward remittance. Remittances that are made from our country to abroad are called outward Remittance. SWOT analysis is the detailed study of an organization’s exposure and potential in perspective of its strength, weakness, opportunity and threat. This facilitates the organization to make their existing line of performance and also foresee the future to improve their performance in comparison to their competitors. As through this tool, an organization can also study its current position, it can also be considered as an important tool for making changes in the strategic management of the organization. The Malibagh Branch of UTTARA Bank has experience and self motivated personnel in foreign exchange division. They are very much efficient and friendly to their customers. UTTARA Bank Limited has already achieved a high growth rate. The number of deposits and the loans and advances are also increasing rapidly. UTTARA Bank has an interactive corporate culture. The working environment is very friendly, interactive and informal. And, there are no hidden barriers or boundaries while communicate between the superior and the employees. This corporate culture provides as a great motivation factor among the employees. UTTARA Bank, foreign exchange department has own license for foreign trading. For this reason, customers get their official formalities so easier. They would not wait for any longer. UTTARA Bank opens L/C in a lower rate than other bank which has strengthened their foreign exchange activity. UTTARA Bank foreign exchange communicate with foreign bank rapidly throughline. Though it has one or two expertise in foreign exchange division, it is not sufficient for doing the desk work. For this reason client have to keep patient for official formalities. UTTARA Bank foreign section is too rigid in case of document preparation; lodgment ant retirement captures other bank which some times dissatisfied clients. The service quality of foreign section is poor with regard to Multinational Banks located here. Corresponding network which is very essential in foreign trading is not so large. UTTARA Bank that it is having a group of unsatisfied employees foreign exchange section. In terms of promotional sector, UTTARA Bank has to more emphasize on that. They have to follow aggressive marketing campaign. Foreign exchange business hugely depends on political stability of a country. After 1/11 in Bangladesh there is a good existing position of UTTARA Bank as compare with other bank. For getting higher market share in foreign exchange business, UTTARA Bank has to be more efficient and swift in service. UTTARA Bank has more opportunity to expand foreign exchange activity by spreading more branches in business area. UTTARA Bank has to take the opportunity of globalization to increase foreign exchange activity. UTTARA Bank can introduce some facility for foreign investor to invest. UTTARA Bank has opportunity to diversify services for customers and lunch new service in market. All sustain and upcoming multinational, foreign and private banks pose enormous threats to UTTARA Bank Limited. Foreign exchange performance of UTTARA Bank is not out standing as compared with others competitors. UTTARA Bank can open an information center for their import and export client. UTTARA Bank has to provide special offer to attract new customers to increase their foreign activities as compared with other bank. Insufficient presence of modern communication equipment. Lack of accounting principle and procedures. I think most profitable sector of bank is its foreign exchange department and advance department. But there officer space is congested and they fail to give customer good entertainment. Application of modern technology such as computerization is not sufficient. Lack of enthusiastic scheme for exporter & importer. Less attractive remuneration package and motivation for the employees. The number of exporter and importer who operate through this bank is not enough to achieve the goal. So UBL should offer more facilities to attract them to be their client. In addition with the present services they should include more services. It is badly needed to provide more services to the customer in order to compete in the market. Banking is a service-oriented marketing. Its business profit depends on its service quality. That’s why the authority should always be aware about their service quality. Foreign exchange department should be fully computerized that the exchange process would be convenient for both the bankers and the clients. The Bank should increase there number of branches and foreign exchange department in other branch. Because they can not compete in the market for their few number foreign exchange department. Bank should offer more facilities to the customers such as credit card, visa card, ATM machine etc to survive in the competition. On-line banking should be introduced for better customer services and to eliminate risk of sending document via post and risk of loss. It also increases quick fund transfer and better satisfaction from customer. Proper Banking software should be used to get best benefit from this department. Payment to the workforce should be such that will encourage the employees to work more. Remuneration package must be impressive and inconsistent with work performance. The bank should give an aggressive advertisement campaign to build up a strong image and reputation the potential customer. The management should take immediate decision to take the current opportunities. Uttara Bank Ltd. being a leading number of private sector banks in the country endeavored to adjust itself to this new situation by adopting pragmatic policies and strategies. The Bank faced the challenge as new banks are arising and many foreign banks start their journey, continued efforts have been made to enhance the growth and development through the realistic policy pursued by the Board of Directors and Management. In addition to that determined and dedicated professional efforts of the Executive, Officers, and Employees helped the bank to go ahead to fulfill the commitment. The declaration symbolized a turning point in the country’s exchange management and exchange rate system. The period preceding this declaration saw an intensification of reforms undertaken by Bangladesh Bank to case control on foreign payments and exchange rate arrangement. Bangladesh now contributes 76% of the country’s total foreign exchange earnings. In recent years of banking business, Uttara Bank Ltd. (Malibagh Chowdhury Para Branch) has shown better performance companring with other second generation bank.